My base used to be in Scarborough, now it is further north, in Tapping which is east of Joondalup across Joondalup lake. Not much of a change for already existing clients. I will not charge you extra for travelling, and I will still drive to Stirling area to provide my services to you. However, a bit more planning will most likely be needed, because of the travel time. Please keep that in mind when you want to book your sessions. New clients I will take on, but will charge a travel fee, and also availabilities will be limited. I am very sorry if this is causing an inconvenience for anyone. First off, I want to clarify the difference between genetically engineered foods, and cross foods. Genetically modified foods, are those that have DNA added to their own, from another source, like bacteria or viruses. GMO foods have been around since about 1994! They were invented to ensure more and cheaper food production, as they are resistant to pests and last longer. It is not easy to find any evidence, that GMO foods have any health risks for the end consumer, hence this post is purely based on my opinion. As I wrote earlier, GMO foods have been around for 20 years by now. And one thing I can see over those 20 years, is an increase in allergies and food intolerances in people. Now, do I know that this is related to GMO foods? No, I don’t. But I follow my gut feeling, and besides other factors, like a super increase in sugar intake and processed foods in general, I believe that my health will be safer when I keep away from foods that have been tempered with genetically. Some people are playing CREATOR, and that simply goes against my ethics. Furthermore, what becomes an economical issue lately, is that the chemical industry, wh o designs those foods, has a patent on them! The crops are often modified so they can not reproduce, and new seeds need to be bought after every harvest. The small growers and farmers will not be able to keep up with the costs involved. And when you think about world hunger, I personally do not see how this is in any way fair or helpful. Furthermore, Monsanto, who is the owner of most GMO creations, is also the producer of Roundup, a well known weed killer, which is used widely all over the world. Still used even though crops have been modified to be weed resistant….. Big question mark here for me. Anyway, Roundup has had a bad wrap being found to be a possible carcinogenic. To me this whole scenario doesn’t make me feel good about it. Hence my decision to buy from local farmers who still grow their own crops, with non GMO seeds. Most GMO is found in processed foods. Easiest solution therefore, go back to basics. Some research claims that GMO produces upnormal cell growth in animal testing, leads to weight gain, organ damage, and immune system upnormalities. As with all research, there is always a pro and a con. So all you can do is start informing yourself, and listen to your intuition. The Functional Lines are extensions of the Arm Lines. On the front they go across the surface of the trunk to the opposite side pelvis and leg. Practically we have 6 lines. 2 on the back, 2 on the front, and 2 on each side called the Ipsilateral Functional Line which runs from the shoulder to the inside of the knee on the same side. These lines are called Functional Lines, because they hardly play a role in our standing posture. They are though heavily involved during activities where one part of the body is stabilized, counterbalanced or powered by its opposite side partner. 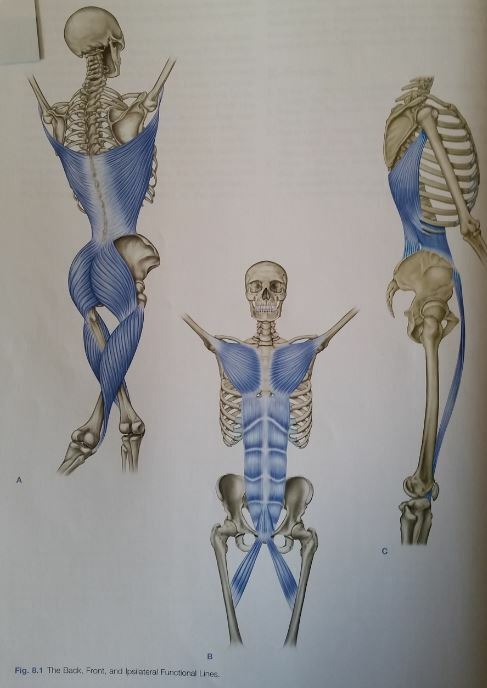 What do the Functional Lines do postural? As mentioned, not very much. However, one thing that is often seen in distorting standing posture is a shortness in distance between opposite shoulder and hip, either through the front or the back. Though this is often due to underlying issues with the Spiral Line or the Deep Front Line. Furthermore, the FLs have some work to do in postures outside our normal standing posture. Yoga is a good example. In many poses here stabilization is needed of the upper girdle to the trunk. The FLs here transmit the strain downward or provide the stability upward to stabilize the base of support for the upper limb. What do the Functional Lines do in movement? The FLs enable us to give more power as well as precision to movements of the limbs. This is because the lever arm which is linked to the limb across the body and so connects the two girdles, lengthens and can load enormous force onto the fascia this way to let it explode through the limb. It works either way though. The weight of the arm can give additional momentum to a kick, as well as the pelvis can contribute to a strong tennis back hand. The most common but often forgotten aspect is the continuous contralateral counterbalance between shoulder and hip at every single step we take. The FLs work in helical patterns and can be considered a supplement to the Spiral Line. We will know follow the lines along through the body, however, this is a very unpractical exercise as the lines of pull and the precision of the lines are constantly changing in movement. The Back Functional Line (BFL) starts at the 1)humerus with the distal attachment of 2)latissimus dorsi following it down and further connecting into the 3)superficial laminae of the sacrolumbar fascia. The BFL crosses the midline at around about the level of the 3)scarolumbar junction, passing through the 4)sacral fascia connecting with 5+6)gluteus maximus on the opposite side. Traveling further down the fibers of Glut Max pass under the 7)posterior edge of the ITT, thus under the Lateral Line, then attaching to the posterolateral edge of the femur. There is fibre linkage between the Glut Max and 8)vastus lateralis, which leads to a connection through the quadriceps tendon to the 9)patella. This one is again connected via the 10)subpatellar tendon to the 11)tibial tuberosity. From here the BFL kinda melts together with the Superficial Front Line. The Front Functional Line (FFL) starts in a similar spot to the BFL as it complements. Starting on the 1)humerus through the distal end of Pec Major, passing along the 2)lowest fibers of that muscle to the 3)5th and 6th ribs. The pectoral fibers form a a fascial continuity with the abdominal aponeurosis which links the external obliques with rectus abdominus. The line follows along the 4)connecting edges of these muscles to the pubis. We call this the semilunar line. Then the line passes through the pubic bone and fibrocartilage of the 5)pubic symphysis, and emerges on the other side along 6)adductor longus, passing down and out and back to attach to the 7)linea aspera on the posterior side of the femur. The Ipsilateral Functional Line (IFL) also starts at the 1)humerus, following the 2)most lateral fibers of latissimus dorsi, which attaches to the outer portion of the 3)lower three ribs and has a very strong connection to the posterior fibers of the 4)external obliques, same as the Lateral Line. We follow the exteranl obliques down to the anterior iliac crest, where the fibers connect over the 5)ASIS to the 6)satorius muscle. This muscle takes us down the front of the thigh to the 7)pes anseriuns, on the medial epicondyle of the tibia. This line can be felt for example when pulling down the hand through the water in a crawl stroke. And this is pretty much it on the Functional Lines for us here. As they are so involved with active movement, there is not many issues here to deal with , as these lines get usually well hydrated, loaded and unloaded. However, if there is issues in the other lines involved it can help to bring awareness to the tracks of the functional lines, to optimize there interplay and timing to improve performance. Heat oil in a large saucepan or Dutch oven over medium-high heat. Add onion, bell peppers and chile to taste. Cook, stirring, until the vegetables release some of their juices and the onion is lightly brown around the edges, 3 to 5 minutes. Sprinkle the vegetables with paprika, salt and cardamom and cook, stirring, until the spices are very fragrant, 1 to 2 minutes. Add pistachios and broth (or water). Stir and bring to a boil. Reduce the heat to medium-low and simmer, covered, stirring occasionally, until the peppers are fork-tender, 20 to 25 minutes. Remove from the heat; let cool 5 minutes. Transfer the soup to a blender (in batches if necessary) and puree until smooth. (Use caution when pureeing hot liquids.) Return the soup to the pan. Whisk buttermilk and cream in a bowl; stir into the soup. Gently warm over low heat. Serve sprinkled with cilantro (or basil).